Definition at line 1217 of file mysqlpl.h. Definition at line 1244 of file mysqlpl.h. Definition at line 485 of file mysqlpl.cpp. Definition at line 497 of file mysqlpl.cpp. Definition at line 511 of file mysqlpl.cpp. Definition at line 525 of file mysqlpl.cpp. Definition at line 812 of file mysqlpl.cpp. Definition at line 1288 of file mysqlpl.h. Definition at line 680 of file mysqlpl.cpp. 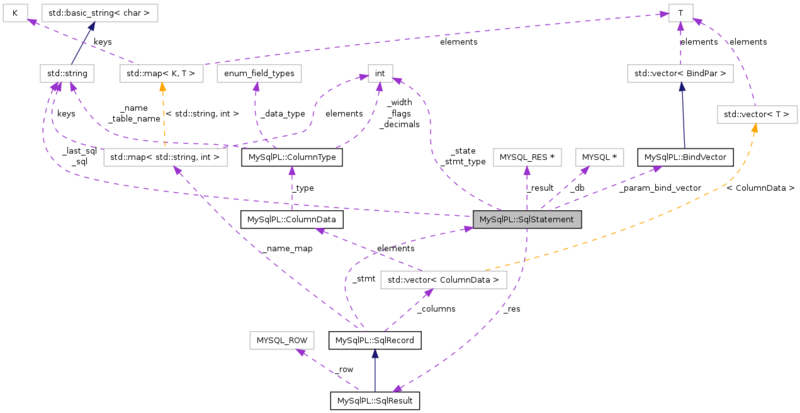 References MySqlPL::BindPar::_len, _param_bind_vector, MySqlPL::BindPar::_ptr, _sql, MySqlPL::BindPar::_type, MYSQL_TYPE_DOUBLE, MYSQL_TYPE_LONG, MYSQL_TYPE_VAR_STRING, MySqlPL::next_bind_variable(), and THROW_MYSQLPL_EXCEPTION. Definition at line 1310 of file mysqlpl.h. Definition at line 1316 of file mysqlpl.h. References bind_params(), execute(), MySqlPL::SqlQuery::get_params(), MySqlPL::SqlQuery::get_sql(), and prepare(). Definition at line 608 of file mysqlpl.cpp. References _db, _param_bind_vector, _res, _result, _state, create_bound_sql(), EXECUTED, FETCHED, get_column_count(), is_select(), and MySqlPL::mysqlpl_check_error(). Referenced by MySqlPL::MSqlConnection::connect(), execute(), execute_fetch(), fetch(), print_results(), and SqlStatement(). Definition at line 1323 of file mysqlpl.h. Definition at line 1330 of file mysqlpl.h. Definition at line 1337 of file mysqlpl.h. References _res, _result, MySqlPL::SqlResult::_row, _state, execute(), EXECUTED, FETCHED, and MySqlPL::mysqlpl_check_error(). Referenced by execute_fetch(), operator->(), and print_results(). Definition at line 767 of file mysqlpl.cpp. References _result, get_meta_res(), and THROW_MYSQLPL_EXCEPTION. Referenced by execute(), and MySqlPL::SqlRecord::SqlRecord(). Definition at line 781 of file mysqlpl.cpp. References _db, get_meta_res(), MySqlPL::ColumnType::init(), and THROW_MYSQLPL_EXCEPTION. Definition at line 1271 of file mysqlpl.h. Definition at line 737 of file mysqlpl.cpp. Referenced by get_column_count(), get_column_type(), and MySqlPL::SqlRecord::SqlRecord(). Definition at line 563 of file mysqlpl.cpp. References _db, is_select(), LONGLONG, and THROW_MYSQLPL_EXCEPTION. Definition at line 751 of file mysqlpl.cpp. References _result, _state, EXECUTED, and THROW_MYSQLPL_EXCEPTION. Referenced by execute(), and get_row_count(). Definition at line 1391 of file mysqlpl.h. Definition at line 537 of file mysqlpl.cpp. References _last_sql, _param_bind_vector, _res, _result, _sql, _state, _stmt_type, and MySqlPL::mysqlpl_check_error(). Referenced by execute(), execute_fetch(), and SqlStatement(). Definition at line 837 of file mysqlpl.cpp. References _res, _state, execute(), EXECUTED, fetch(), MySqlPL::SqlRecord::print_columns(), and MySqlPL::SqlRecord::print_values(). Definition at line 1371 of file mysqlpl.h. Definition at line 1228 of file mysqlpl.h. Referenced by execute(), get_column_type(), get_row_count(), and SqlStatement(). Definition at line 1254 of file mysqlpl.h. Referenced by get_last_sql(), and prepare(). Definition at line 1240 of file mysqlpl.h. Referenced by bind_param(), bind_params(), create_bound_sql(), execute(), and prepare(). Definition at line 1256 of file mysqlpl.h. Referenced by execute(), fetch(), operator->(), prepare(), and print_results(). Definition at line 1242 of file mysqlpl.h. Referenced by execute(), fetch(), get_column_count(), get_meta_res(), is_select(), prepare(), and ~SqlStatement(). Definition at line 1235 of file mysqlpl.h. Referenced by create_bound_sql(), and prepare(). Definition at line 1252 of file mysqlpl.h. Referenced by execute(), fetch(), is_select(), prepare(), and print_results(). Definition at line 1258 of file mysqlpl.h.